Enhance the Volto (aka Plone-React) page editor by adding new tiles, implementing a way to allow complex page layouts, fix bugs, enhance the UX, and write documentation how to develop add-ons for the editor. Enhance the Volto (aka Plone-React) page editor by adding new tiles, implementing a way to allow complex page layouts, fix bugs, enhance the UX, and write documentation how to develop add-ons for the editor. Volto is a new pure ReactJS-based frontend for the Plone CMS. The Volto editor is built on top of DraftJS, an editor framework by Facebook. The editor does a great job of allowing the editors to add, edit, and manage text, images, and video content on a Plone page in a very user-friendly way. Though, we have to add more tiles (building blocks of a page) such as a hero tile, an RSS tile, and others. We also need to support more complex page layouts where multiple tiles are displayed in the same row. Albert Casado created a draft for the UX/UI of such a solution. for GSOC 19 we have to start working on it now? same for that GATSBY JS project also? is pastanaga UI a part of GSOC -19? Yes. Both Volto editor and GatsbyJS will be proposals for GSOC 2019. We plan to submit another proposal for Volto enhancements and Pastanaga UI, yes. Can you please tell me who will confirm that contributor assignment agreement.So that I can ask them to approve it soon as I can start contributing as soon as possible. FYI: You can start writing bug reports and creating pull request without the contributor agreement signed or confirmed. @tisto is writing bug reports same as creating issues? and if any doubt can I ask you? Yes. You can create an issue and label it as a bug. You can of course ask me anything anytime. Hello,I am working on this project. I have read the documentation and build the project. After running plone/volto in register form after filling all the details submit button is not working. Can I create this issue? @PUNITBATRA , I think that is because cors are not working properly.. try using cors extension. @uwaiszaki I tried it by using cors extension.But it is still not working. @tisto Above error message of register form submit button is an issue or it is due to some other reasons...Please help? This is actually a known backend issue. 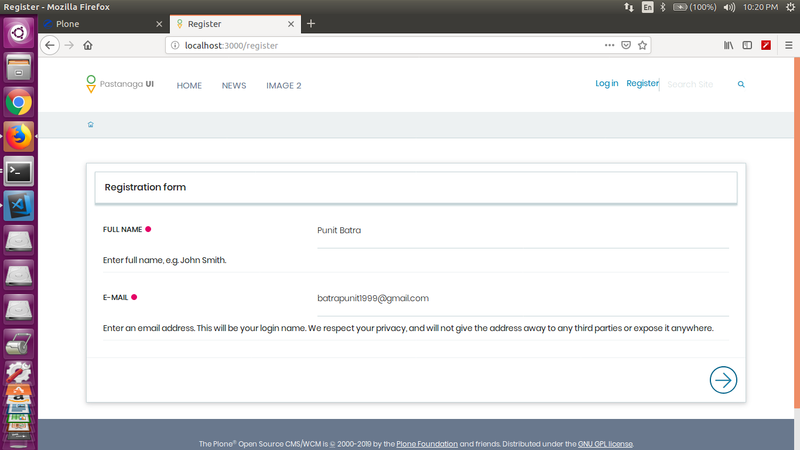 The Plone backend does not know the production URL that it needs in order to being able to send emails with the registration confirmation.